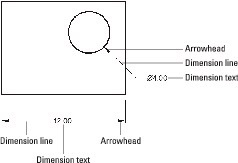 Three dimensioning commands can help you place multiple dimensions very quickly in AutoCAD. They’re found near the middle of the Dimensions panel of the Annotate tab on the Ribbon. Continue — DimCOntinue (DCO): Having placed one linear dimension in the drawing, you can now carry on placing a series of dimensions end-to-end. AutoCAD automatically picks the end of the previous dimension as the start of the next one, so you need pick only the end of the next one. Base — DimBaseline (DBA): This one works much like DimCOntinue except that AutoCAD selects the start of the previous one as the start of the next one. You thus end up with a series of stacked dimensions, all measuring from a common starting point. Quick Dimensions — QDIM: Interestingly, this is one of the few dimensioning commands that doesn’t start with DIMxxx. When you invoke it, it invites you to select objects. The best bet usually is to use one or more window selections (pick from left to right), each of which completely surrounds several objects. Now whenever you press Enter, AutoCAD automatically applies DimLInear dimensions wherever it can, and you might be surprised at some of those places. It can place dimensions in several formats, including continue, baseline, staggered, ordinate, and several others. For convenience in repeat operations, it remembers the last mode you used. If you want to be superefficient, memorize the three-letter command aliases for the dimension commands you use most often, of which DIM should top the list. The parts of a dimension.